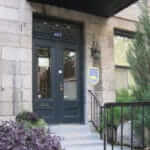 What about a studio in the heart of the nicest neighborhood of Montreal? Anne Ma Soeur Anne is two steps away from renowned restaurants, trendy bars and boutiques in the Plateau. The 17 studio-rooms can accommodate between 1 to 4 people and are all equipped with a kitchenette and a bathroom. In some of the studios, an integrated wall bed unit allows you to transform the room into an office. All the rooms are air conditioned. All rooms are also equipped with wifi, a TV, a coffee machine, a microwave, a toaster, and a hair dryer. You’ll really feel at home in this homey atmosphere. Furthermore, the owners bring croissants to your door every morning on top of the continental breakfast that is included in the charges. Note that the rooms facing the street can be a little noisy. Amongst the many accommodation options in Montreal, Anne Ma Soeur Anne is one of the very few spots located in the heart of the Plateau Mont-Royal, one of the most typical neighborhoods of Montreal. Located on Saint-Denis Street, this Bed & Breakfast is a few steps away from renowned restaurants, trendy bars, and avant-garde boutiques of Montreal. Anne Ma Soeur Anne is a short walk away from two metro stations, them being Mont-Royal and Sherbrooke on the line 2 also known as the Orange line. 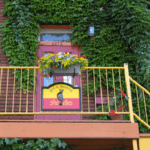 For the biking enthusiasts out there, the bed & breakfast faces the bike path on Rachel Street and there are bike rental shops and Bixi (a bike-share program) stations nearby.